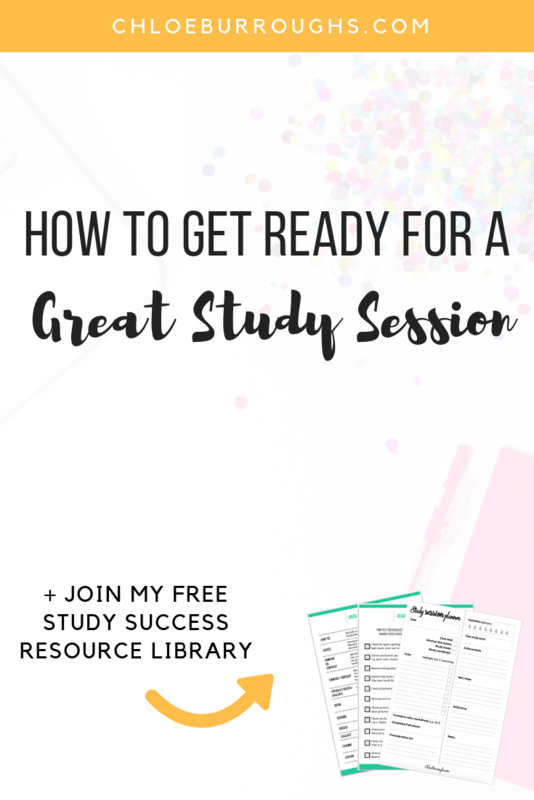 If you want a great study session, you need to get ready for it. You wouldn’t rock up to a marathon wearing the wrong clothes, on two hours sleep, an empty stomach and with no plan. So, make sure you don’t sit down to study when you’re not ready to do great work. 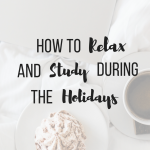 In this blog post I’m going to share with you what French cooking has to do with productivity AND my five-minute, seven-step process to prepare yourself for a great study session. 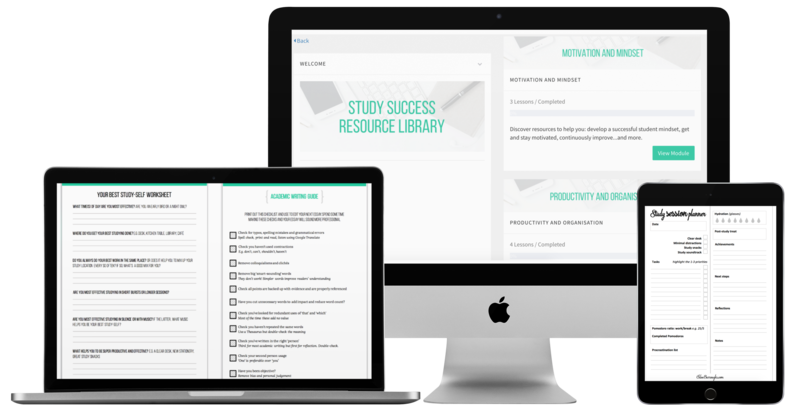 Don’t forget to sign up for my free studying resource library. ‘Mise en place’ is a French culinary term which means ‘everything in its place’. This refers to the setup process a chef uses before they start cooking. If they want their cooking to go smoothly and their output to be incredible delicious, and still hot when they plate it, they have to get ready first. They gather and prep their ingredients, collect the equipment they’ll need, make sure their space is clean and get clear on the plan or recipe they’re going to use. By getting ready they save time, improve their focus and reduce interruptions. 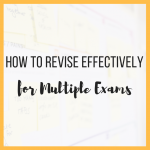 We can apply mise en place to our studying by introducing this simple but powerful five-minute process into our studying. Now I’m not a tidy person. My bedroom doesn’t have a floor it has a floordrobe…BUT my desk is super tidy because I value my productivity. To have a great study session, spend a few minutes tidying your desk of anything that you don’t need such as study materials, cups, plates…etc. 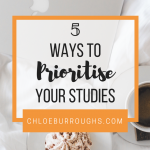 If you have lots of studying ‘stuff’ like spare notebooks, folders, stationery then see if you can move it off your desk for now and then back later because it’s important to balance having a lovely study space and a study space you can do great work in. 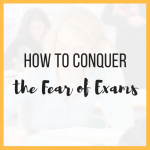 You don’t want to waste time rushing to grab a folder looking for a textbook so collect all the stationery and study materials you’re going to need for a great study session before you start. 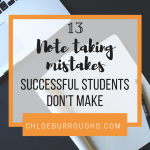 The most common mistake I see students make is keeping their phones next to them or non-study Internet tabs open while they study. Our devices are glued to us almost 100% of the time so we have to be intentional about unsticking them for awhile. Now I’m not sat over here like a martyr because I’m guilty of this too. I know I can only have a great study session if I let my phone go but it’s difficult sometimes. If you can learn to study intentionally, with total focus on your study tasks and nothing else, you will get your studying done quicker. Would you rather study for two hours while checking your phone and social media or one hour so you can relax guilt-free for the spare hour? 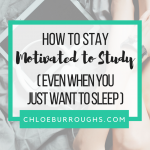 If you want to achieve more in less time, do what you need to do to remove distractions before you start studying. Put your phone on silent, airplane mode, do not disturb or move it to another room. Turn off the radio or TV, move somewhere quiet and close down any non-study Internet tabs or email that you do not need. This is a hard habit to break but ask yourself what’s more important – checking Instagram/replying to that WhatsApp message, or doing well in your studies? This is simple stuff but make sure you have food and drink before you study to keep your energy and hydration up. Make a hot drink and grab a glass of water as well as your favourite study snack. I’d like to tell you to pick a healthy snack but right now chocolate is my best friend so I pick this! Getting ready for a great study session requires you to remove any chance of your brain making excuses to stop studying. You don’t want to get five minutes in and realise you need the bathroom, your bare feet are cold or your seat’s uncomfortable. So do what’s necessary beforehand – wear comfortable clothes, take a bathroom break, grab a lamp or get a cushion for your chair. Listening to music while I study is a non-negotiable for me. I have to have earbuds in, the music on low, and the music cannot have lyrics because lyrical music makes my brain feel squiggly and I can’t think straight. A few studies appear to demonstrate that non-lyrical music can improve focus. For example, a 2012 study published in Work magazine found that performance in a work environment decreased when background music had lyrics. The participants’ productivity and attention were worse with lyrical music compared to non-lyrical music. To have a great study session, try adding non-lyrical music to your routine. There are lots of different types of instrumental music so don’t think that you’ve tried to listen to some classical music before and it didn’t work because you have a lot of options. My go-to music is film or video game soundtracks because they’re designed to engage you and help you focus on the content but not be so engaging that you switch your focus to the music instead. The Theory of Everything by Jóhann Jóhannsson. To have a great study session you need to make sure you’re working on the right things. You may be busy the entire time and ticking off tasks here, there and everywhere, but you don’t want to finish and realise you didn’t move the needle on anything important. Your essay is still not started, you didn’t email your tutor even though you need to, you didn’t start your revision. So your last step before you jump into studying is to get clear on your ONE priority for the session. What ONE task will have the most impact on your progress and grades? ​Pick that, even if it’s hard/boring/long and do that. Break it down if you need to but working on your priorities will help you reach your study goals quicker. I hope this process help you have a great study session. Try it out and let me know how it goes over on Instagram @chloe.burroughs.